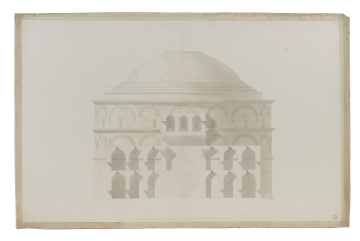 One of this set of drawings is in the Victoria & Albert Museum (section through portico, Box A 148A, No.3436.183. See P.du Prey, Sir John Soane, 1985, in series of 'Catalogues of architectural drawings in the Victoria and Albert Museum', catalogue 4). drawings 2 and 4 are copies of Thomas Hardwick's drawings while drawing 5 is 'an adaptation of an earlier one drawn by Hardwick' (du Prey, 1977, op.cit. p.119). 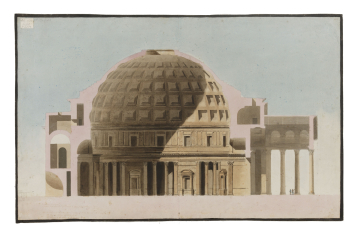 Hardwick's drawings of the Pantheon are in the RIBA Drawings Collection (SA26/7 and SA69/2(1-8). 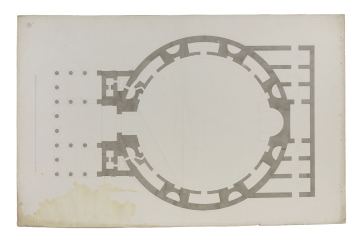 The ground floor plan, drawn to a larger scale than the other drawings, is the result of Soane's own measuring. See in Sketchbooks catalogue: 'Italian Sketches', 1779 (SM volume 39, f.41r) for rough elevation and section, and also see in Sketchbooks catalogue: 'Miscellaneous Sketches' 1780-2,(SM volume 40, ff.80v, 73v) for plan and section of chambers above portico, and detail of domed ceiling. 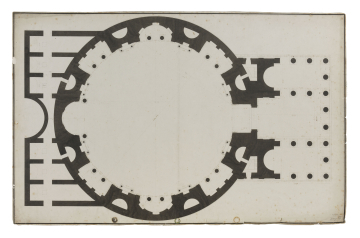 Drawings 3 and 5 were used for Soane's Royal Academy lectures. Drawing 5 seems, like others, to have been 'touched up' for that purpose, for instance, some fine pen lines have been crudely gone over with a denser, thicker pen, the two figures in the portico may have been added to emphasise the huge scale of the building and the strong black wash border has certainly been added. The Pantheon was and is, for architects, the key building of ancient Rome. First built in 25BC by Marcus Vispanis Agrippa, it was rebuilt on a circular plan (the portico with its inscription being re-used) by Hadrian in A.D.120-5. And consecrated as a church in 608.